Airport posting this afternoon as I wait at my gate. Flying to Munich, then Nice, then taking a ride over to Monaco where I’ll be camped for the next good while helping report on the PokerStars and Monte-Carlo®Casino EPT Grand Final for the PokerStars blog (about which I was writing last Friday). This’ll end the 11th season of the EPT, with a huge series packed with side action. There are 78 events on the schedule all told, although a few of the numbered ones are satellites. I believe that’s a new standard for the number of events listed in a single EPT series, and I’m getting in a little early to help report on some of them prelims. 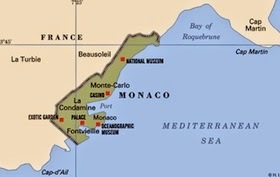 I mentioned last week how Vera and I had a chance before to visit Nice, which is the closest I’ve been to Monaco before. Was during that year we lived in France, spending the better part of it in a tiny closet of an apartment up in rainy, gray-skied Lille in the north. Needless to say, the coastal city looking out on the Mediterranean offered quite a contrast, providing some nice, sunny memories from near the end of our année abroad. We were on a tight budget that year (one reason for the très petit living quarters), and so had to pick our spots, vacation-wise, not to mention save our francs whenever we did decide to take the TGV somewhere different. That’s right -- francs. Gives you an idea at least how long ago that was. Hate leaving Vera and all our four-legged friends on the farm, but I am looking forward to another new adventure, one that might revive some memories of old ones, too. Talk to you next six time zones from here. Meant to add, have safe travels. We loved that year there, despite the rainy weather. A neat city, and from which it was easy to make frequent trips to London, Paris, and Belgium.